For professional environments including care homes and nurseries, our Gompels Premium Laundry Detergent offers exceptional value for money. Delivered in a durable plastic tub with screw down lid for safe storage, this powerful formulation targets and breaks down stubborn stains at temperatures as low as 30 degrees. Using a patented triple enzymatic action, it can be used to break down proteins, fats and carbohydrates from a wide range of linens, fabrics and clothing. With a fresh and pleasant scent, it is suitable for use with sensitive skin and works well within autodose systems. 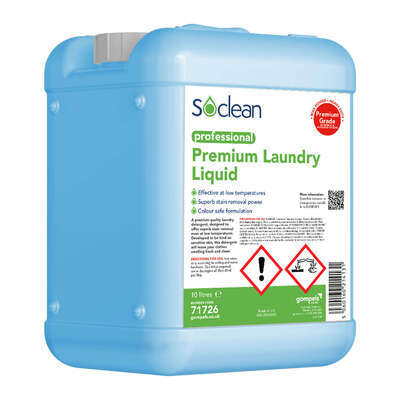 This large 10 litre bottle of laundry detergent can be decanted into smaller bottles or safely stored away with your existing cleaning products to be on hand when needed. Consider adding some of our other essential washing items to your basket today including our Laundry Bags 30" x 33" or our Gompels Heavy Duty Low Temp Stain Remover 10l. All our products are available at exceptional wholesale prices.